Priyanka Chopra was spotted out in New York City on Tuesday (April 24) heading to a series of press junkets to promote season three of ABC’s television drama thriller series ‘Quantico’. 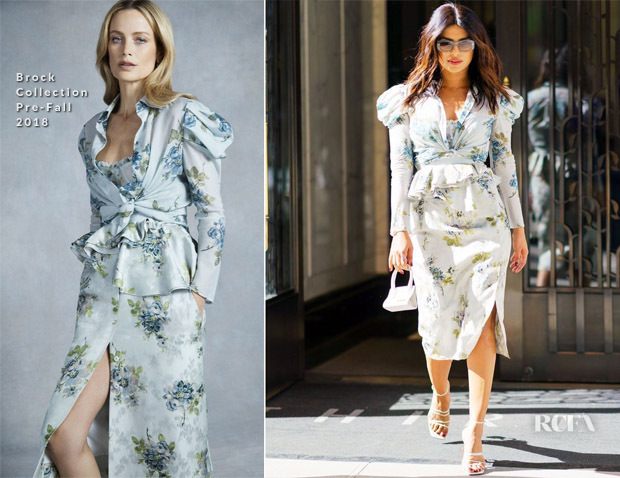 The Bollywood beauty wore a gorgeous Brock Collection Pre-Fall 2018 look which was full of the joys of Spring. I love how this look showcases the label’s innate feminine aesthetic with a sensual touch thanks to the corset and slit in the skirt. Styled with Le Specs shade, Jacquemus sandals and a bag so micro it doesn’t even look big enough to carry an iPhone, the actress was serving up plenty of summer inspo.